I graduated high shool from Velma-Alma High School in 1982. Upon graduation I attended East Central University in Ada, Oklahoma. Bachelor's of Elementary Education from East Central University with a concentration in science. Oklahoma Teacher's Certification in Elementary Education and Early Childhood Education. I began teaching at Velma-Alma Public Schools in 1998 and have been here ever since. This is my 28th year teaching. I have taught in several schools, including: Ada, Cushing, Moore, Apache, and Duncan. I married Kenny Bare in 1985. Our oldest child, Katie Pogue, teaches 5th grade at Velma. Our youngest daughter, Alex, graduated from the University of Oklahoma in December of 2014 with her Bachelor's in Journalism with a concentration on professional writing. She is currently working towards her Master's in English Education from OU. 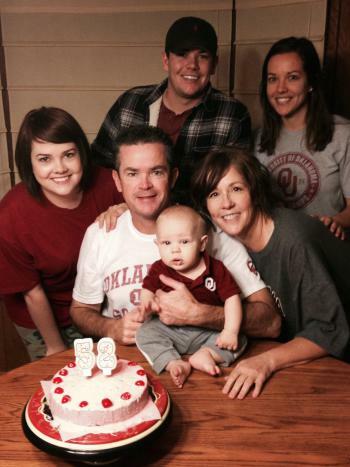 Our youngest child, Dallas, is working towards his degree in communications from OU. I am so happy to announce that our first grandchild was born this year! Dawson was born in May 2014 to Katie and Adam Pogue. He is so loved and spoiled.